Night After Night: Far beyond driven. I finally managed to witness firsthand the Gustavo Dudamel Experience (patent pending) tonight (November 12) at Carnegie Hall. I'm very glad to have done so, because this concert by the Simón Bolívar Youth Symphony Orchestra of Venezuela managed to dispel whatever reflexive instincts toward dubiousness and cynicism Dudamel's extraordinary press may have preconditioned. This was a starry event, for sure. Cameras from PBS affiliate WNET/Channel 13 were in the balconies and on the stage, including a cameraman situated between the second violins and cellos, staring up at the podium. (This presumably means you'll see this concert on "Great Performances" sooner or later.) Emanuel Ax, Barbara Cook and Plácido Domingo were in the audience, along with a great many New York critics and record company executives. Let's get one thing straight right away: The Simón Bolívar Youth Symphony Orchestra is a fine orchestra. A very good orchestra. Some soloists (flute and clarinet, especially) were outstanding; some sections were less accomplished than others. Overall, this huge, handsome group has a huge, handsome sound, and a tremendous capacity for excitement. It is not, however, a world-class, full-time professional ensemble, and should not be expected to sound like one. After intermission, Simon Rattle took over for Shostakovich's Symphony No. 10, a piece that Dudamel conducted at the Proms this summer. Rattle drew a much more focused, nuanced sound from the orchestra, including pianissimos that made you lean forward in your seat. The performance was spectacularly controlled. 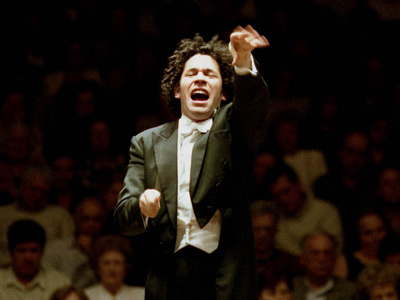 What was lacking, however, was the kind of emotional charge that Dudamel had provided. Or, for that matter, that Valery Gergiev -- without question a lesser technician -- got from his Kirov Orchestra in this piece when I heard it in March 2006. There, the emergence of Shostakovich's musical signature -- D-S-C-H (D - E-flat - C - B) -- in the Allegretto symbolized a hard-won triumph in having managed to outlive the terror that was Stalin. That performance emphasized Shostakovich's unlikely victory, while still ending in a mode that seemed to question what the proper way forward might be. In the context of Rattle's micro-managed interpretation and following hot on the heels of a hell-bent Allegro movement, the DSCH motto sounded more like a shellshocked babble -- as if all Shostakovich could do was quietly knock his head against a wall and repeat his own name over and over to prove that he was still breathing. Nothing during the episodic final Andante-Allegro made me feel that Shostakovich had ever managed to regain his composure. And overall, I felt less moved than manipulated. Audience response commanded an encore; Rattle, who apparently had nothing prepared, called a quick conference with the concertmaster. After some debate, Rattle announced Leonard Bernstein's "Mambo" while advising the audience that the orchestra didn't have the proper equipment on hand. "Play anything," he told the percussionists. Play they did, dancing and twirling in formal black instead of Venezuela's flag. Violins flipped and trumpets spun. It was great fun, and also neatly controlled by Rattle. Before the concert, Ara Guzelimian hosted an onstage chat with José Antonio Abreu, architect of Venezuela's remarkable "El Sistema," of which Dudamel and the Simón Bolívar Youth Symphony Orchestra are the most prodigious products. Guzelimian, an excellent interogator, didn't have much say here: Abreu, whose comments were translated by New York-based conductor Alondra de la Parra, waxed rhapsodic about the success of his program in Venezuela and throughout Latin America without divulging many nuts-and-bolts details about how it was achieved -- especially from a financial perspective. Abreu, whose achievements in Venezuela unquestionably deserve respect, went on to say that similar programs were being launched in Los Angeles, San Francisco and Boston, and told the audience that he had urged the Carnegie Hall board to start presenting its artists in Venezuela. Not that I wanted Guzelimian to get all Lee Bollinger here, but I did hope that some political context might be provided for the remarkable progress -- on both artistic and humanitarian levels -- that "El Sistema" has caused in Venezuela. I regret that I'm too swamped to give this event the attention it deserves, but I'm glad you're on the case. The one thing I wanted to add is something you and I have talked about before: how exhilarating is it to hear an orchestra like this where everyone onstage -- and I mean everyone -- is deeply, genuinely committed to and engaged with the music? You are right that some of the young soloists lack the finesse of their counterparts in, say, the Berlin Phil, but I will take the SBYSO's thrillingly electric (and stunningly tight) full-orchestra tuttis over the, shall we say, "indifferent professionalism" of so many big-name orchestras. In a New York minute I will. It's actually very simple: when you care, we care. When you are just going through the motions, we can tell, even when the performance is polished to the point of spotlessness. Maybe even especially when. Composer and bandleader Darcy James Argue, the "very smart musician" to whom I refered in my original post, is right on the money here. And he is absolutely right in drawing attention to the complete committment that anyone present could feel emanating from the stage on Monday night. With that in mind, I will be very interested to hear what the New York Philharmonic sounds like when Dudamel takes up the reins for a few days in early December. brilliant write-up. simply made me wish i was there.